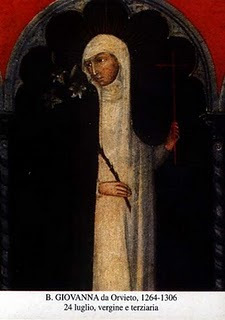 One of the stigmatists of the Order who deserves to be better known is Blessed Jane of Orvieto, whose marvel-filled life was the edification of Umbria in the latter half of the thirteenth century. Jane was born near Orvieto, in 1264, and both parents died when she was very small. Left to the care of casual neighbors, the little girl gre up with a special reliance of her guardian angel. She was a pious and intelligent child, , spending her time in prayer , even when very young. Since it was necessary for her to earn her living , Jane studied dressmaking and became proficient at it. For several years she worked at this trade , prayerful and happy and undisturbed about her future. However, she had a number of unhappy experiences on the street on her way to work, for young men were attracted by her beauty. It became apparent to her that she must make some public declaration of her intentions if she wanted any peace. She decided to enter the Third Order of St. Dominic. Dressed in the habit of the mantellate, she would be safe from rude remarks and from any misunderstandings. Jane’s friends opposed her plans, because they had already helpfully chosen a husband for her, and were trying to arrange a meeting of Jane and the man they had selected. Because of her youth, the Dominicans delayed in accepting her. Only after a long period of prayer and fasting was she able to win the privilege of putting on the Third Order habit and living with the other members of the Tertiary chapter. Once a member of the Order she so much desired , she set her goal at the highest sanctity and worked at attaining it. She prayed all morning and part of the afternoon, leaving herself only time to do enough work to care for her few needs and some alms to give the poor. She soon reached a remarkable state of prayer; she participated bodily in whatever she was contemplating. Her director learned not to say anything that would send her into ecstasy until he was through instructing her. Once he mentioned the martyrdom of Catherine of Alexandria and said piously, “Arise, O blessed Catherine,” and Jane arose, in ecstasy, and remained suspended in the air for an hour. If he talked about the Crucifixion her arms would go out in the form of a cross, and she would rise in the air like a figure on a crucifix. On Good Fridays she experienced the terrible agony of the Passion, and one could hear her bones cracking and see the bloody sweat. She received the stigmata, but it was not always visible. Along with her remarkable life of prayer, Jane had to contend with physical pain. Once she was cured of a serious illness by a miraculous appearance of our Lord on the cross. He appeared to her in the midst of a bright light and gave her a cup of wine to drink. She obediently drank it, and she was instantly cured. Another time, when she was too ill to go to church to receive Communion , Our Lady came and brought the Holy Child to her. One of Jane’s principal crosses was the lack of privacy. The whole town knew about her ecstasies. As soon as she fell into one, people came running to look. Jane tired to persuade the prioress to keep them out, but the prioress was interested herself, and saw no reason why anybody should object to being watched if they were not doing anything wrong. Jane wept with embarrassment when people asked for her blessing, and assured them over and over that she was not a saint but a wicked sinner, a diagnosis which nobody believed but herself. Blessed Jane died, in 1306, and was buried in the Third Order cemetery in Orvieto. The following year her body was transferred to the chapel of the Three Kings, and many prodigies occurred at that time, giving impetus to the process for beatification, which, however, was not completed until more than 400 years later, in 1754.